We received this wedding invitation in the mail yesterday and I was immediately smitten. Simple- yes, but oh the glorious textures! 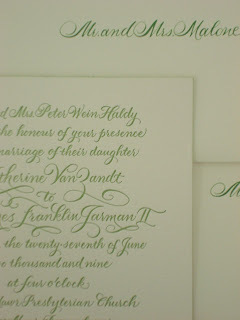 Invitation is letterpressed, interior and exterior envelope was calligraphed by the same person that did the invitations. So lovely. Oh my goodness. It's amazing. I adore these invites. Do you know whose beautiful hand created this art?